Tidewater Community College will celebrate the 100th anniversary of Naval Station Norfolk – along with more than 1,500 graduates ­– at its 64th Commencement Exercises on May 13. Capt. 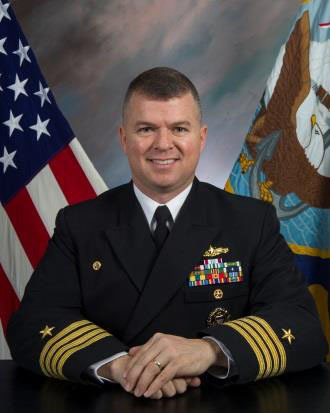 Rich McDaniel, commanding officer of Naval Station Norfolk, will deliver the keynote address at the ceremony, which begins at 10 a.m. at the Ted Constant Convocation Center. McDaniel assumed command of the Navy base on March 10. He served at sea on five U.S. Navy combatants and two afloat staffs. His military career, which spans 25 years, includes deployments to the Arabian Gulf, Western Pacific, Eastern Pacific, Indian Ocean, Mediterranean and Caribbean. He earned his master’s in national security affairs and strategic studies from Naval War College in Newport, R.I., and his bachelor’s in history from the University of Memphis. McDaniel is also a 2013 graduate of the Joint Forces Staff College. Student speaker Megan Roche is among the 12,000 military-related students who attended TCC in the 2016-17 academic year, about 35 percent of the college’s enrollment. Roche, a Navy veteran, will graduate with an Associate of Science in Science. She has been accepted as a transfer student by the College of William & Mary, where she intends to pursue her bachelor’s in biology. Ultimately, she plans to achieve a doctorate in physical therapy. Dorcas Helfant-Browning, principal broker and managing partner of Coldwell Banker Professional Realtors and a tireless advocate for higher education, will be awarded an honorary Associate of Humane Letters. Helfant-Browning served two terms as chair of the Tidewater Community College Board and is the current chair and treasurer of the TCC Real Estate Foundation Board. She served on the State Board for Community Colleges, the governing body of the Virginia Community College System, and was chair from 2014-2015. She is currently serving as vice chair of the Virginia Foundation for Community College Education.